Last fall marked the release of Tablet & Pen: Literary Landscapes from the Modern Middle East, an anthology of modern Middle Eastern literature in translation that has had a surprising success in the American market. 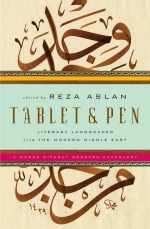 Tablet & Pen represents a fruitful collaboration between the literature-in-translation online magazine Words Without Borders and anthology editor Reza Aslan, author of the bestsellers No God But God and How to Win a Cosmic War. 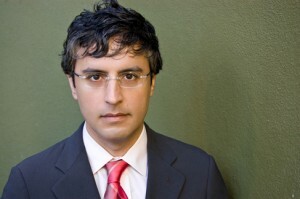 Aslan’s high media profile netted the book some prominent publicity, including stops at the Colbert Report, Diane Rehm, Tavis Smiley, and MSNBC’s Morning Joe, among other places. Tablet & Pen includes stories, essays and poetry from four languages — Arabic, Persian, Turkish and Urdu — including an essay by Lebanese mystic Gibran Khalil Gibran and selections by the well-known female Iranian poet Forugh Farrakhzad. Aslan describes the editing process as “basically, just a year of solid reading,” with help from the Words Without Borders team, as well as scholars and experts in the various literatures, many of whom were writers and translators themselves. Although fluent in Arabic and Persian, Aslan found himself in charge of combing through Turkish literary selections: “I had to become an expert in Turkish literature of the last century. In that regard, what was very helpful to me was Turkey’s PEN center, which provided me with a journal of new Turkish literature, including some great contemporary writing. The poet Can Yücel, with his short three- to four-line poems, for example, I found amazing.” Ultimately, of the 130 pieces, almost half of them were newly translated or retranslated for the book. The genesis of the anthology came from Words Without Borders, which since 2003 has set itself the ambitious goal of “translating, publishing, and promoting the finest contemporary international literature” for English-language readers. Each month, the magazine publishes eight to ten pieces in translation — stories, poems and occasionally essays—based on a common theme. Occasionally, the issue will focus on a particular language or region (writing from Hungary, Japan, and Pakistan have all been the subject of recent issues), or on a topic or genre, such as international reporting, science fiction, or (this month’s issue) horror. One of their most popular (and eye-opening) subjects is an annual issue devoted to international graphic novels. According to executive director Joshua Mandelbaum, Words Without Borders, although based in New York, has a strong international following: over 45% of its audience reside outside the U.S. In addition to English-speaking countries, Words Without Borders draws readers primarily from India, Germany, China, France, Italy and Japan, says Mandelbaum, receiving an estimated 30,000 unique visitors per month. Frustrated by the low profile of literature in translation among American readers, Alane Salierno Mason, senior editor at W.W. Norton and founder of Words Without Borders, originally conceived the idea for a magazine dedicated to translation back in 1999. “I was in the discussion and brainstorming stage for two or three years. I started talking up the idea at every opportunity,” including at a publishing panel discussion on translation. Dedi Felman, then an editor at Oxford University Press, happened to be in the audience, loved the idea, and paired up with Mason. “Dedi was instrumental in connecting the idea with what was possible on the web,” says Mason. “She already had web experience, and understood how to connect editorial ideas to what was technically possible.” To handle much of the day-to-day editorial work, Felman and Mason brought in Samantha Schnee, who, as an editor at Francis Ford Coppola’s Zoetrope, brought a literary magazine background to the mix. From that point on, with an initial NEA grant in hand, “it was really a triumvirate [triumfeminate?] that launched the magazine,” says Mason. DISCUSS: Will 2011 Be the Year Translated Lit Gains Traction in the US?